Water shortage has become a subject of intense public debate in the present political narrative on resource management and riparian rights. 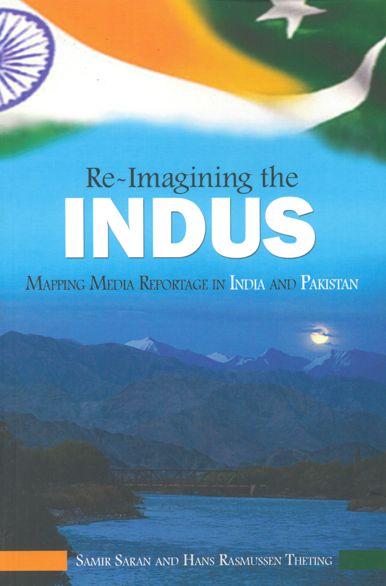 In an attempt to discern the divergence on core issues and mainstream media reporting, Re-imagining the Indus is a methodological study based on Media Content Analysis of the reporting on water issues related to the Indus, in the leading dailies of both India and Pakistan. This monograph seeks to capture the existing discourse and stimulate policy dialogue on the subject. What is the general discourse on water scarcity and related crises in the Indian and Pakistani media? The study conducted by Samir Saran (ORF) and Hans Rasmussen Theting, scrutinised the media coverage on water on three specific themes – the political discourse, water governance and people, practice and environment. Titled ‘Reimagining the INDUS: Mapping media reportage in India and Pakistan’, the study found that the Indus Water Treaty (IWT) does not dominate the reportage in Pakistan, indicating a low level of discontentment or critique. It also found that it is only in the months of winter, when the water flow is low, that inter-country dispute between India and Pakistan, and significant negative sentiment against India, gets attention in Pakistan. But in the Indian media, Pakistan only appears during spring months. The study, now published in the form of a book, found that agricultural concerns and inter-provincial disputes dominate media reportage in Pakistan while in India media lays greater emphasis on urban water concerns and interventions, including ground water and domestic consumption. The study also showed that media reports in both the countries, Pakistan more than India, recognise the need for the two countries to cooperate on water issues. From the study, it was also clear that in both India and Pakistan, there is equal emphasis on the aspects of water governance and infrastructure. With a post-crisis global recession deepening in the eurozone and other parts of the world, the BRICS countries can take the lead to set up a ‘BRICS Fund’ to reenergize faltering growth in both developed and developing economies, argues Samir Saran and Vivan Sharan. The current global economic scenario is uncertain, volatile and misleading. The uncertainty stems from a breakdown in macroeconomic correlations and a continuation of a post-crisis recessionary environment in large parts of the world. The volatility emanates from the unpredictable price action across asset classes and increased sensitivity of almost all asset classes to financial and political fragilities, like those that are prevalent in the euro zone. Meanwhile, the misdirection and misallocation of capital across asset classes is a direct consequence of the lack of clear signals by political institutions and markets alike, leading to broad scale risk aversion especially in the case of sovereign investors such as central banks. Increasingly, as such strains constrains economic development and investment flows, it is necessary for the BRICS nations to realise their new roles in the emerging global economic order. The imperative to shape the dynamics of future growth must come from these new drivers of economic momentum. One of the ways to do it could be the creation of a BRICS fund – a consolidated wealth fund with appropriate and proportionate monetary contributions from the central bank reserves of all the BRICS countries. Such a multilateral fund, with pre-determined investment mandates, could prove to be a useful tool for rebalancing capital flows, and reenergizing faltering growth in both developed and developing economies. About one eighth of all assets managed in the US are allocated to “impact investments” or “social investments” – an impressive statistic that must be replicated by emerging economies. With a view to the future, it is clear that social, economic and environmental sustainability are going to be essential for economic development and growth – at individual company, industry and international level. 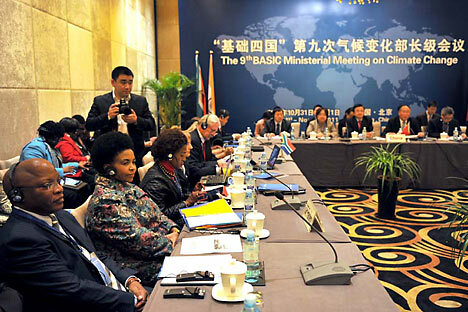 A BRICS fund which invests back into sustainable initiatives both within the BRICS and outside in the least developed economies could prove to be an unparalleled tool to promote and accelerate sustainable growth trajectories. Rather than being a problem of capital generation, the key challenge in financing transitions to sustainable, low carbon trajectories is the redirection of existing and planned capital flows to financially viable allocations in non-traditional asset classes. Alternative investments into sovereign debt of struggling economies based on mutually agreed upon special purpose vehicles could be another avenue for funding which would also leverage the BRICS’ bargaining position in multilateral negotiations. In the recent international climate negotiations at Durban, it was decided by member countries that that the second commitment period of the Kyoto Protocol will run from January 2013. Furthermore, it was decided that the Durban Platform for Enhanced Action – an agenda strongly backed by the EU and the Association of Small Island States (AOSIS) would be instituted to develop another new Protocol by 2015 – an international legal instrument that will be applicable to all parties to the UN climate convention and will come into effect after 2020. Simultaneously, the parties to the COP agreed to institute a $100 billion Green Climate Fund (GCF) – a measure largely intended to appease developing nations such as those in the AOSIS to come on board the EU agenda. The strategy worked well, although smaller economies should be aware that in the past a bulk of the funds that have been made available to developing countries through the Clean Development Mechanism of the UN have gone to private project developers in China, India and Brazil (in that order). China got the lion’s share of close to half of the total investments made till now. If the investment flows were analysed at from a primarily deterministic prism, it would be hard to conclude that the funds from the GCF would benefit small developing economies, or impact real organic change. The Durban negotiations provided a textbook case where bargaining positions of developing countries, and especially those in the BASIC group of countries including Brazil, South Africa, India and China, could have been leveraged, had these countries already committed to fund sustainable development through a parallel fund. Instead, the outcome was sub optimal – given that there still is no mechanism for the eviction of carbon squatters who have conveniently pushed the onus onto countries that are still in the low to mid income development profiles for what is effectively a $100 billion payoff. The BRICS fund could also provide suitable SPVs to smoothen any future financial shocks to the highly integrated global economy. Just as in climate change scenarios, financial shocks and imbalances are likely to alter the growth trajectories of developing economies in a much more significant way than of advanced, developed economies which already have monetary cushions owing to high per capita incomes and strong existing infrastructure. The BRICS fund could help the central banks of the member countries counter the effects of erratic demand cycles, global resource pricing distortions, and systemic contagious failures in global financial markets, through strategic investment stimuli. Such a mechanism would not only be complementary to the policy mandates of the central banks of the BRICS nations, but would send a strong signal about their overall financial policy independence of Bretton Woods institutions such as the IMF. Whatever the investment mandate – the overall emphasis for such a fund would have to be the generation of absolute returns to be considered worthwhile by all of the relevant stakeholders. Furthermore, it is beyond doubt that multilateral institutions have limited degrees of freedom. If a BRICS fund becomes a reality, a necessary condition would have to be complete operational and functional independence to deliver what is needed. This would only be possible with the effective and efficient delegation of policy sovereignty. The modern-day central banking trend of institutional independence would be a good model to follow. Ensuring political and financial goals are separate, and asset allocation occurs purely on the basis of the accepted common mandate and profitability would create a strong shared institution. From purely the perspective of profitability and diversification of sovereign assets, such a fund would provide a good alternative mechanism for central banks within the BRICS to allocate appropriate portions of their reserves to riskier assets than they traditionally are mandated to invest in. Thus, the fund could substitute for Sovereign Wealth Funds, an increasingly popular concept for diversifying sovereign reserves through alternate mechanisms, while simultaneously creating significant signaling benefits which would be advantageous in matters of setting trends and norms in international financial investment agendas in the future. Today, financial institutions are zealously protective of their cash assets. This is far from being a panacea for the prevailing economic scenario with a failing European idea and a politically problematical environment in the US. A BRICS fund could provide the much-needed liquidity and confidence, especially to capitalise on resilient business models looking for seed money. For decades, economies in the BRICS consortium have been subjected to the rhetoric of structural reform by actors that have consistently overspent on consumption. The retooling and rebalancing of the global financial system is an imperative that cannot be ignored any longer. With the increasing cooperation between BRICS countries along political and economic lines, the conceptualisation of alternative mechanisms to promote the development agenda at a time when financial institutions are cautious with their money is certainly justified. Disruptive changes to status quo policies and investment patterns are traditionally most effective in uncertain, volatile environments. Looking forward, this decade presents a mixed bag of opportunities and challenges for nations and economies. With the emphasis and impetus of growth shifting to the emerging and recently emerged economies, it is only natural that the BRICS countries take the initiative and the lead to innovate their way out of international crises. Samir Saran is Senior Fellow and Vice President at the Observer Research Foundation. Over the past year, he has been actively involved in setting up a green business “gTrade” to promote sustainable investing in India. Vivan Sharan is Associate Fellow at the Observer Research Foundation. He has interned at the UNDP, and PWC undertaking disparate research tasks. His primary research interests are in monetary policy, equity/debt markets in America and the BRICs. Please click here for the online audio file and here for the presentation. 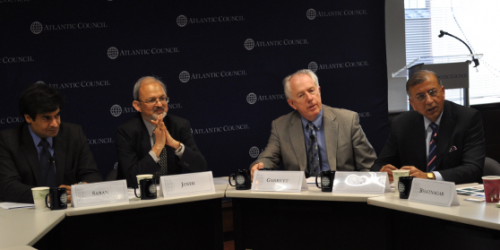 On December 2, the Atlantic Council’s Strategic Foresight Initiative and South Asia Center hosted a discussion on the global trends shaping India’s future towards 2030. India has undoubtedly taken a central seat in the international arena with a growing population of over one billion citizens and a globally competitive economy. The country is now a hotspot for technological innovation, urbanization, and an expanding private sector. Such rapid growth, however, brings new challenges for this emerging nation. Scarce water resources, lack of urban infrastructure, the need for rural development, and weak coordination between government, public, and private institutions, can put India at a critical juncture in its development as a regional and global power. This discussion will explore both the potential challenges and opportunities for India in the coming decades.